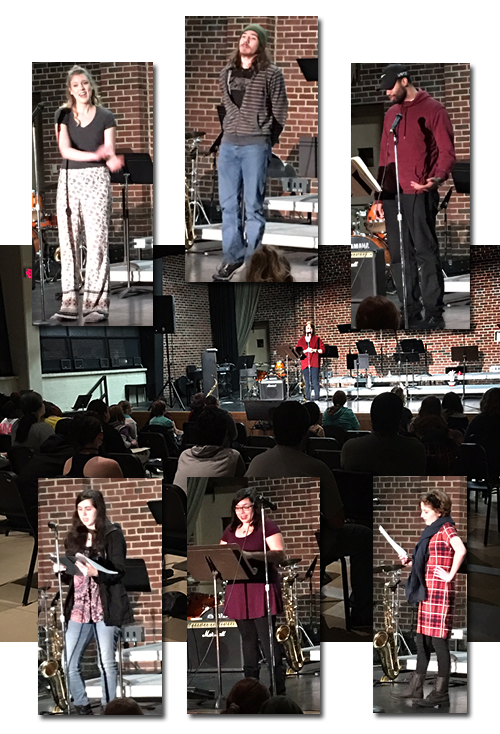 Cowley College students presented poetry, fiction, non-fiction and lyrics at the Writers’ Corner held Thursday, February 11. Marlys Cervantes, director of the creative writing program at Cowley, and Lucia Morales, Creative Claws president, welcomed guests for the evening. “There was a wonderful variety of writing, presentation styles and, as always, a wonderfully appreciative crowd,” Cervantes said. Joining Cowley student writers, Cervantes, staff member Gavin Brown, adjunct Deb Dockter and Dockter’s daughter, Marie, who won a recent contest, all presented works. Seventeen writers, three new to Writers’ Corner, presented 31 original works. Upcoming events for the program include a talent show on March 10 and a film contest with the screening of entries to be held March 31. In addition, with a grant from the V.J. Wilkins Foundation, the creative writing program will host poet Marshall Todd Fuller and screenwriter Randi LeClair for workshops and presentations on March 28-29. If you are interested in additional information about any of these events, contact Cervantes at marlys.cervantes@cowley.edu or through the Humanities Department at Cowley.